This issue, published March 2017, features inspiration from UNDER THE SEA. 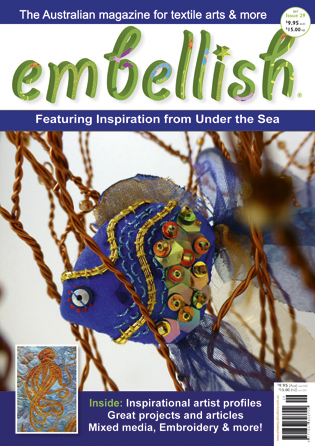 Embellish is published each March, June, September and December. In this issue we have an Artist Profile: Artist Profile: Carole Redlich by Carole Redlich; Artist Profile: Margaret Marsh by Liz Wauchope; Reader Postcard Challenge by Lynda Worthington; Our Wishes for the World: Exhibition by Sue Dennis; Shop Profile: knitalpaca by Lauris Jephcott; Inspiration from Under the Sea by Lynda Worthington.